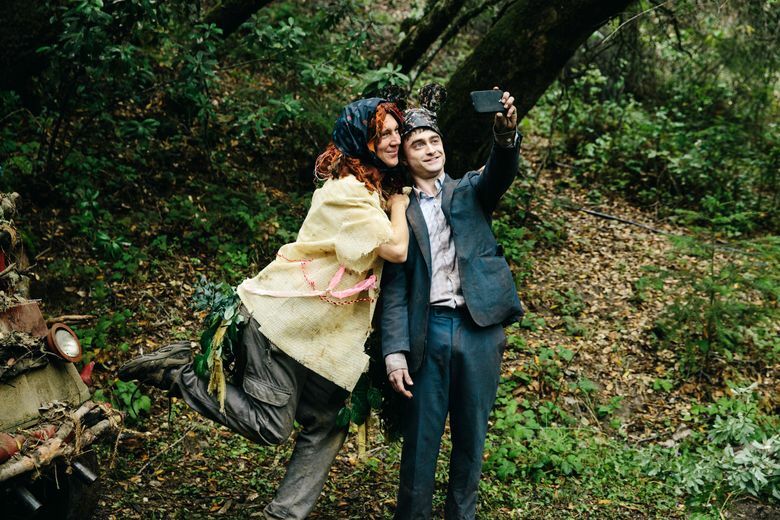 Movie review of “Swiss Army Man”: Daniel Radcliffe gives the performance of a lifetime playing a flatulent corpse in this often hilarious, ultimately poignant and always bizarrely offbeat one-of-a-kind picture. Rating: 3.5 stars out of 4. Forget Harry Potter. Kid stuff. As a flatulent corpse found rolling in the surf off a desert island, Radcliffe does amazing work with a very limited palette of physical movements. With eyes fixed and staring from a face the color of clay, and with his body motionless in awkward stick-figure poses, Radcliffe builds a whole performance from the movement of his mouth. Talking haltingly, he brings his character to … well, if not exactly life, then consciousness of a sort. He conveys curiosity and an odd sort of sweetness in a movie that is way beyond odd. ‘Swiss Army Man,’ with Paul Dano, Daniel Radcliffe. Written and directed by Daniel Kwan and Daniel Scheinert. 95 minutes. Rated R for language and sexual material. Several theaters. And yes, that’s very strange. And very funny. The sensibilities of the guys that came up with this, writer-directors and first-time feature makers Daniel Kwan and Daniel Scheinert, come from so far out in left field that the field vanishes from view. The atmosphere is surreal yet reality-grounded as Hank, a lonely, suicidal fellow on the verge of hanging himself (because he’s lonely, see), drags Manny up out of the surf and befriends him. Acute loneliness will make a guy do strange stuff. The corpse speaks and amazement follows on Hank’s part, especially when he learns of all the cool stuff a gas-filled corpse can do. Like propel projectiles out of his mouth. And thus is game killed and food felled. Versatility, of a Swiss Army knife variety! Oh, and, also relationship advice and dating tips are offered from Hank to Manny inspired by a tattered copy of a Sports Illustrated swimsuit edition. Sometimes hilarious, ultimately poignant, “Swiss Army Man” is a picture like no other.